Current major guidelines for type 2 diabetes suggest checking treatment response to glucose-lowering medication with an HbA1c measurement at 3 to 6 months [1–3]. What is unclear is what to do if there is an apparently poor response; should this treatment be continued with ongoing response monitoring, should it be switched to an alternative medication, or should another medication be added in? To date, no data from randomized controlled trials or observational analyses are available to address this apparently simple but clinically important question. Despite this, national guidance in some regions has recommended discontinuation of therapy if a response threshold on initial HbA1c testing is not met . Data from both trials and observational studies demonstrate that there is a substantial amount of HbA1c variation within individuals on stable therapy over time. This variation produces a standard deviation (SD) of HbA1c within individuals of around 5.0 to 7.1 mmol/mol (0.46 to 0.65%) [4–6]. Assuming an approximately normal distribution of HbA1c variation, one third of people will have an HbA1c variation greater than this SD. 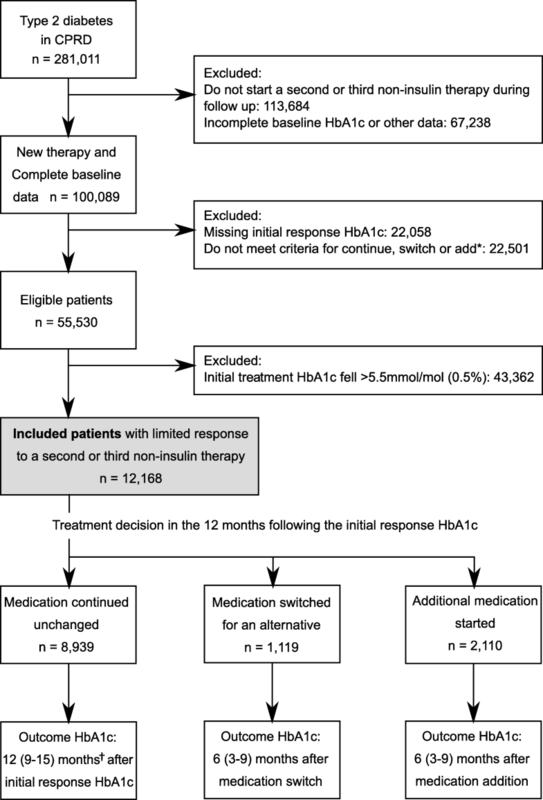 As most non-insulin glucose-lowering medications reduce HbA1c by around 11.0 mmol/mol (1.0%), with some variation by class of therapy [7–9], there will be a substantial proportion of people in whom the treatment effect when starting a therapy is at least partially obscured by the biological noise in HbA1c. Given this noise, a reasonable approach to the patient who has apparently had a limited initial HbA1c treatment response might be to continue the therapy unchanged, anticipating that the true response will become apparent over subsequent HbA1c measurements. If this hypothesis is correct, we would expect people who switch to another medication will have similar HbA1c outcomes compared with those continuing the initial therapy unchanged. We would also anticipate people adding another new therapy will experience a greater HbA1c reduction than those who switch despite the apparent lack of effect of the first medication. If the lack of an initial glycemic response is a true reflection of non-response to the new medication, subsequent treatment switching should produce a similar response to adding another medication. We assessed initial HbA1c response in participants commencing second or third glucose-lowering medication (excluding insulin) between 2004 and 2017 (inclusive) meeting the following criteria: new therapy taken continually for at least 6 months (based on prescriptions issued), pretreatment HbA1c (baseline HbA1c) > 58 mmol/mol (7.5%), a measure of post treatment HbA1c after 6 months (initial treatment response HbA1c), ≥ 80% adherence to all prescribed glucose-lowering therapy, and no change in other concurrent glucose-lowering therapy. For the baseline HbA1c, we used the most recent value measured within the 6 months preceding the start of the new medication. We defined the initial treatment response HbA1c as the nearest HbA1c to 6 months (± 3 months) after initiating the new therapy. Non-adherence was defined using medication possession ratio of less than 80% [12–14]. A tendency to continue treatment unchanged in people who have not reached HbA1c targets (termed clinical or treatment inertia) has been reported previously [17–19]. These data are consistent with our finding that continuing a treatment in those with a measured limited HbA1c response was the most common clinical practice. Our results suggest that a large proportion of response variation is due to “noise”—HbA1c variation related to diet or lifestyle change and/or measurement error, rather than innate variation in true “biological” response between individuals. If patients with initial worsening of HbA1c were true “non-responders” to therapy, then switching to a different therapy would be a much more effective strategy than continuing the same ineffective medication. In contrast, our results show little difference between switching therapy and continuing the same medication unchanged—in other words, these patients are obtaining underlying glucose-lowering benefit from the medication, and the initial lack of HbA1c improvement is substantially due to chance variation in HbA1c caused by other, non-treatment-related, factors. If HbA1c is repeated without changing therapy, it will therefore improve due to the effects of regression to the mean . This is entirely consistent with previous studies that show very high variation of HbA1c on stable glucose-lowering therapy [7–9]. This has implications for the study and implementation of stratified or precision approaches to glucose-lowering therapy; while recent studies show it is possible to predict differences in mean glucose-lowering response by patient characteristic or biomarker status [21–24], it may not be possible to predict a person’s response to therapy at an individual level.